Like many boys, Charles. 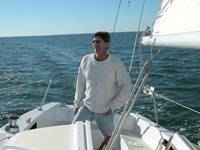 F. “Bud” Kirby, Jr. loved ships. He had drawings, models, pictures, newspaper clippings, and scrapbooks. 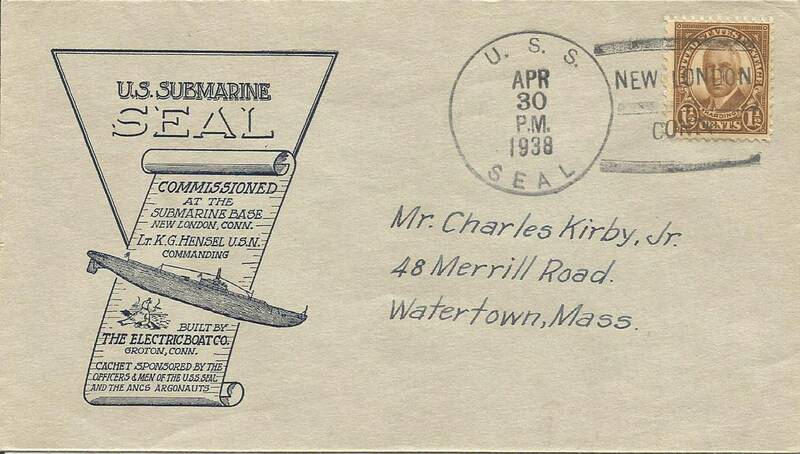 And, as his son, Don, recently learned, he had cachet covers of submarines. 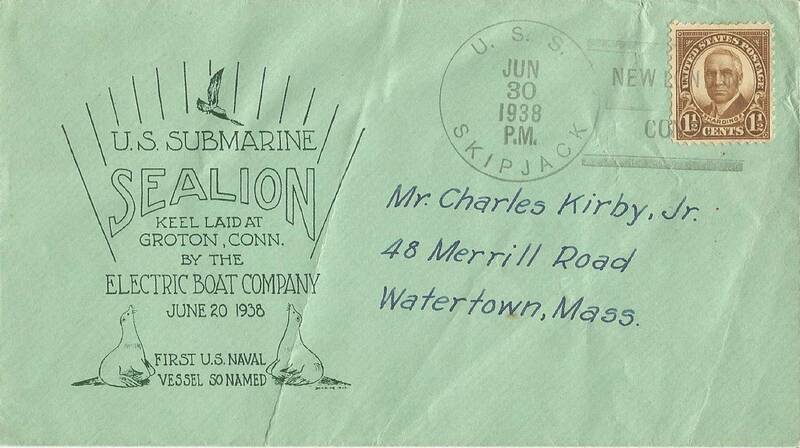 Bud would send stamped envelopes to the Electric Boat Company that he had addressed to himself in Watertown, Mass. 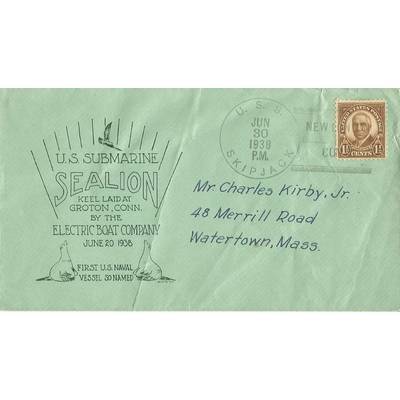 These envelopes would be stamped with a commemorative cachet and then appropriately cancelled at Groton, Connecticut, where the EB shipyard was located, or on the ship if it had been commissioned. 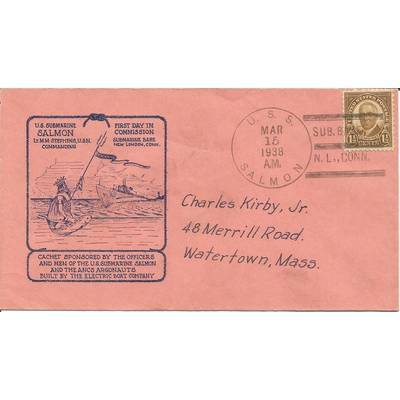 Each ship has its own post office, and its own cancellation stamp. During the war ships used a more generic “U.S. Navy” cancellation for security reasons. 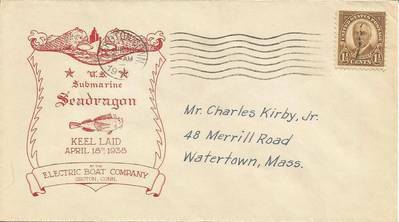 The hobby of collecting ship covers started in the 1930s. 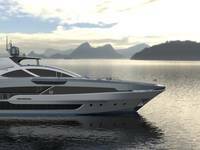 They were issued for events such as keel laying, launching and commissioning. 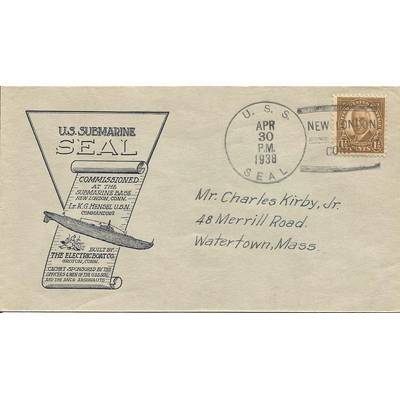 Organizations such as the American Naval Cancellation Society (ANCS) and Universal Ship Cancellation Society (USCS) promoted the hobby. For Kirby, his collection is small, and not necessarily rare or especially valuable, but says a lot about his general fascination with ships. After high school, Kirby would spend time aboard real naval ships. His college education at Boston College was interrupted by the war. He enlisted in the Marine Corps and became a radio-tail gunner on SBD Dauntless dive bombers at Guadalcanal and the South Pacific. He spent time on aircraft carriers and transports. After the war he completed his education at UCLA and lived in California and Washington. He passed away in 2010. “My dad kept these in the safe deposit box in an envelope labeled "Bud's personal momentos,” said Don. 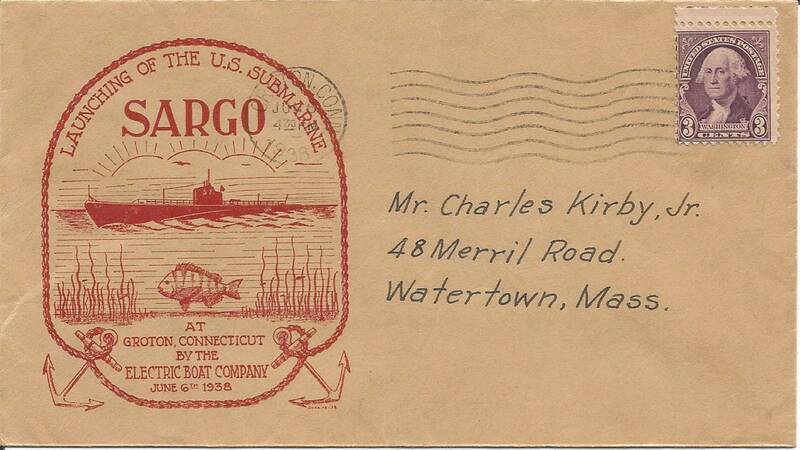 Kirby’s collection are of pre-war submarines, but all of them would serve in the Pacific, like him. They were the submarines Salmon, Seal, Skipjack, Sargo, Seadragon and Sealion. 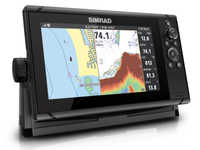 They represent several different classes of submarines, but with very similar characteristics. The newest of the six boats, Sealion, was attacked and damaged in the Philippines on the opening day of the war with Japan, and scuttled soon after. But the other five served with distinction and survived the war. 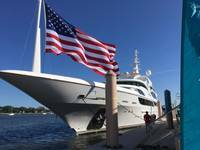 The author is a retired U.S. Navy captain and Bud Kirby’s nephew. 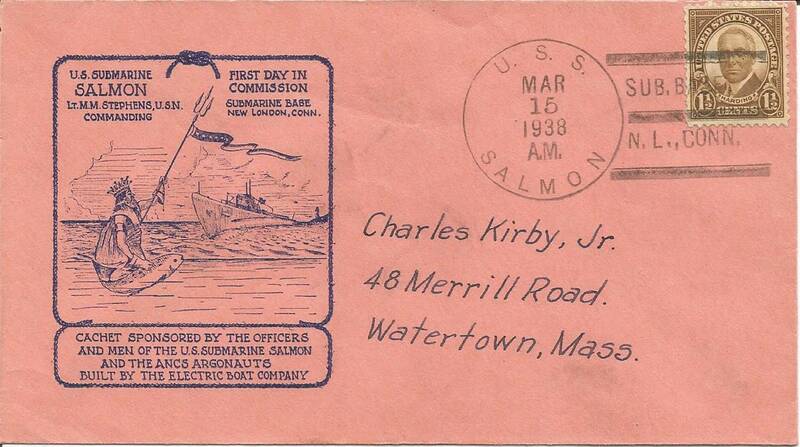 Salmon earned nine battle stars for World War II service in the Asiatic-Pacific area. Seal was awarded ten battle stars for her World War II service. 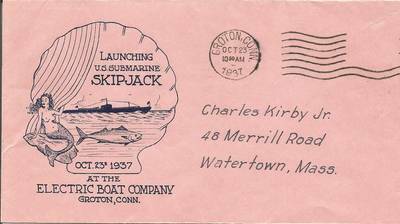 Skipjack received seven battle stars for World War II service. 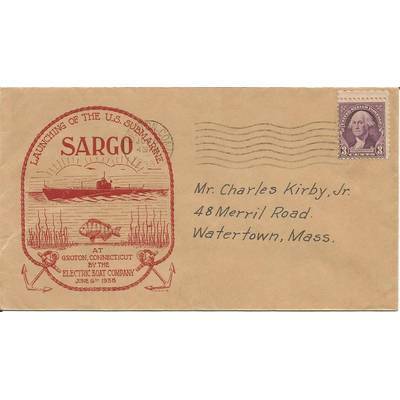 Sargo was awarded eight battle stars for her service in World War II. Seadragon earned 11 battle stars during World War II.